"As if it should be necessary either to offend or to be offended"
And thus the desire of defending liberty caused each to prevail [raise itself] in proportion as they oppressed the other. And the course of such incidents is, that while men sought not to fear, they begun to make others fear, and that injury which they ward off from themselves, they inflict on another, as if it should be necessary either to offend or to be offended. Machiavelli identified this problem in the sixteenth century. His solution was that states ought to limit the power of individuals. As we will see the Buddha looked at this same problem very differently. I'm writing these words in the middle of a UK election campaign which is characterised by character assassination attempts by members of all three parties on each other. Media pundits happily join in this schadenfreude-fest. It's not enough to shine, one has to tarnish one's opponents. Of course our elections are a zero-sum game, i.e. win-lose is the only possible solution (hung parliaments not withstanding). During the second live leader's debate I watched the live blog comments on The Times website for a while. It was almost as if the comments were being randomly generated. "Love politician X; hate him. He makes sense; he doesn't make sense. He is sincere, he is insincere." People watching the same debate, and hearing the same speeches, were coming out with radically polarised views - and given that The Times is famously right-wing the reader/viewer comments were surprisingly evenly spread across the spectrum of possible reactions. In effect the comments were incoherent and irrational. And this is how we choose our government! (One can only hope that Winston Church was right and this is less worse than other forms). Note that Machiavelli's observation is of people concerned with "defending liberty". We so often make war for peace, don't we? The US and UK take out Saddam Hussein (unerringly referred to by politicians and the media by his first name 'Saddam' which I think reflects a kind of ongoing ritual humiliation and infantilisation) because his of (fictitious, as it turns out) weapons of mass destruction and failure to abide by UN resolutions made him a danger to world peace (meanwhile other states with nuclear weapons have become untouchable!). In our long history of defending liberty our governments have invaded countries, toppled legitimate governments and installed puppet dictators whenever it suited them and they thought they could get away with it; and ignored atrocities and injustices when that suits them; and more recently they have even knowingly tortured prisoners. Having read about history of interference by UK/USA governments in Iran recently I found myself sympathising with their pursuit of the one weapon that they see as preventing them being at the mercy of the cynical West ever again! Isn't it funny that the media never seek to contextualise the hostility of Iran towards the west by pointing out why the Iranians legitimately distrust our governments? Machiavelli observed "that injury which they ward off from themselves, they inflict on another, as if it should be necessary either to offend or to be offended". "AS IF IT SHOULD BE NECESSARY" Why do we think like this? I've pondered this question over many years. Scholarly debates tend to reduce this question to one of "nurture or nature". I suspect that something in our make-up as humans (especially as humans living the way we do - see Why do we Suffer?) makes us tend towards a zero-sum approach. On the other hand, whatever our make-up it is clear that conditioning plays a part in the person we become. When all of our role models behave a certain way we are apt to ape them. When they say one thing and do another we learn not to trust them (incidentally this theme is addressed brilliantly in the BBC TV sit-com Outnumbered). Abandoning victory and defeat, the peace-lover dwells in bliss. The Buddha sees the same behaviour around him, but rather than seeking to limit individual power the Buddha's radical solution to the zero-sum game is simply not playing the game of conquest and defeat at all. I would venture that few of us give serious consideration to not playing. Most Buddhists, including me, flirt with it, or take it on partially. This is not intended as a criticism - the Buddha lived a lifestyle almost unimaginably different from anything we see around us now - having no family ties, no home, no possessions, no safety net other than what his good reputation provided (and we need to be clear that the Buddha and his followers were a minority and not universally admired despite what the Buddhist texts tell us). We stay in the game, I think, because we see not playing as a kind of loss, or letting other people win. As I've said before [Martyrs Maketh the Religion] being homeless, for instance, is seen as a very low fate indeed. If we take Nietzsche's metaphor of man being a tightrope stretched between animal and übermensch (over-man) then, stretching the metaphor, most of us don't believe we can operate without a safety net. Which brings to mind the recent movie "Man on a Wire" - it's possible to operate without a safety net only with dedication, excellent preparation, intense self-awareness and focus. Which is not far from what the Buddha said about life. It's interesting to note the declining interest in our Order for the more radical forms of living and working arrangements pursued in the 70's and 80's; and the rise of having families, developing careers and saving for pensions. I suspect that playing the win-lose game is a bit like casino gambling. The house always wins. By playing the game at all, one tends to lose to the establishment. purifying your own mind, this is the edict of the Buddhas. 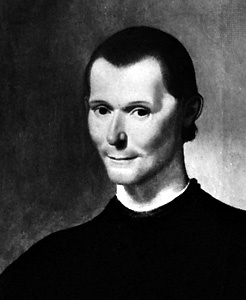 Niccolò Machiavelli. The Discourses on the first Ten (Books) of Titus Livius. 1.46. www.intratext.com. See for example: Wheen, Francis. How Mumbo-jumbo Conquered the World: A Short History of Modern Delusions . HarperPerennial, 2004.
image: Machiavelli, detail of an oil painting by Santi di Tito; in the Palazzo Vecchio, Florence Alinari. One time the Buddha was staying outside the walled city of Sāvatthī (modern day Śravasti) in the park that the merchant Anāthapiṇḍika had purchased from Prince Jeta at great price. 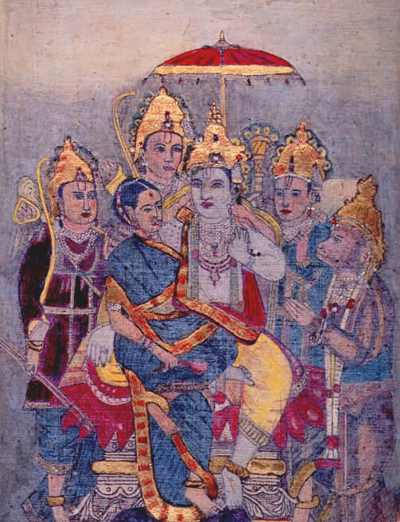 Sāvatthī was the capital of the Kingdom of Kosala  and was ruled by King Pasenadi. Pasenadi was a follower of the Buddha, and so was his wife Mallikā. Mallikā was wise and her husband often asked her opinion about things. Therefore don't harm another self that is loved. Hopefully this will already have struck readers as curious. Yes, the word being translated as self is atta, or ātman in Sanskrit. And yes, it is being affirmed as existent and the thing that we all hold most dear. What a surprise this text is! What to make of it? I think we must proceed cautiously and think pragmatically. Firstly the use of atta here is most likely simply the reflexive pronoun - "me" - but even so it suggests a kind of egotism that we associate with ātman as self in any case. Many scholars have attested to the fact that nowhere does the Buddha explicitly deny the self - he never says outright "there is no self". It would be easy to get bogged down here if we allow ourselves to drift into metaphysics. However the Buddha's point was not about whether the self exists or not, but to encourage people to examine their own experience and the apparatus of experience. He is telling people who believe in an ātman (that links not only successive lives, but moments of consciousness) to look for that persistent factor (if they must) in their experience - in mind and the senses. Although the language, context, metaphors etc all vary the Buddha's advice boils down to the same thing for everyone: examine your experience, pay attention especially to how experience arises and passes away. The text acknowledges that we all tend to think of ourselves as the most important person. We look after ourselves first, we tend to try to meet our own needs first, and we protect ourselves above others. (I speculated as to why this is in Why do we suffer?) This is not an absolute it is a generalisation and as a contrast we might think of the selflessness of a mother protecting her child as is referred to by the Karaniya Mettā Sutta (some well known characters in the Pāli scriptures, notably Bahiya, are gored to death by cows with calves). One of my preceptors says: "we all go around thinking that other people are thinking about us, but they aren't: they are thinking about themselves". Surely this is not a positive thing? In fact surely this self-centredness and self-preoccupation is the big problem that we all have. I think this highlights an aspect of the Buddha's teaching. He himself does not seem to have been bound by jargon and formalised ways of talking about the Dharma. The Buddha himself seems to have felt free to present the Dharma in whatever way suits his audience. He is able to talk to Brahmins as a Brahmin, to Kings as Kings, to merchants as a merchant and to a farmer as a farmer. The Buddha so embodied and epitomised the Dharma that he could present his teaching in many different ways, as long as the person ended up paying attention to the conditioned nature of experience. In a passage in the Saṃyutta Nikāya the Buddha questions Sariputta about his attainments. He does so employing a number of different metaphors and formal ways of talking about liberation. At first Sariputta is confused, but he continues to confidently answer the Buddha's questions. Friends, the first question that the Blessed One asked me had not been previously considered by me: thus I hesitated over it. But when the Blessed One approved of my answer, it occurred to me: 'if the Blessed One were to question me about this matter with various terms and with various methods for a whole day, for a whole day I would be about to answer him with various terms and various methods. Maybe we could say that the one who is liberated from suffering is also liberated from jargon - which makes it seem all the more attractive in my view! So my self is most dear to me, and your self is most dear to you. With a little effort I can imagine that since you experience selfhood in the way that I do, then you experience suffering in the way that I do . You experience pain, and disappointment, and grief, in the way that I do. You also experience happiness and joy, and will ultimately experience liberation in the same way as me. Although we see ourselves, experience ourselves, as separate and unique, we are in fact very much alike. All humans seem to share certain basic emotions, and to have this instinct for self preservation. And it is by seeing that we share this characteristic that the golden rule emerges quite naturally - do unto others and you would be done by. One can nitpick and find exceptions, but lets keep an overview - the golden rule is a generalisation that describes the spirit of morality, not the letter. So despite the fact that we Buddhists are fixated on self and views on self, it's important to see this text as being about empathy, not about self. This text is a good example of the pragmatism of the Buddha. He's not interested in metaphysical questions such as whether there is a self or not - this is not a question that can be finally decided. One can believe in a self, or not believe, but it's just an opinion, just a view. If you do believe in a self then the Buddha's challenge to you is to find it in experience, and by doing so to draw your attention to the conditioned nature of experience. If you do not believe in a self, then his starting point will be different, but he will still draw your attention to the conditioned nature of experience. What this says to me is that there's no point in quoting dogma at people who have different beliefs, because dogma doesn't make any difference. What makes a difference is practice and experience, not doctrine. Too many Buddhists focus on orthodoxy - having the right opinion - and seem to forget that according to orthodoxy Reality is ineffable. They refuse, however to follow Wittgenstein in staying silent about that of which nothing can be said. However it is true that confusion divides the will and can make wholehearted practice difficult if not impossible. The main point though is the nature of empathy - which is imaginative identification - and it's role in ethics. Morality does not exist in the abstract. Buddhist ethics is about how we relate to other people. This imaginative identification, which underlies ethics, can become the whole path via practices such as mettābhāvanā, which culminate in Brahmavihāra - an earlier (and often forgotten) metaphor for nibbāna. Śravasti and Kosala were north and west of Magadha - in what is now northern Uttapradesh. Rāja Sutta. Ud 5.1 (PTS: Ud 47); and SN 3.8 (PTS: i.75) - the two texts are identical. This is my translation. Also translated by Thanissaro at Access to Insight; and Bhikkhu Bodhi. The Connected Discourses of the Buddha. p.170-171. The Kaḷāra Sutta. SN 12.32 (S ii.54). Bhikkhu Bodhi's translation, The Connected Discourses of the Buddha. p. 570.
cf Dhammapada 129-130 which represents a kind of negatively phrased counterpart of this verse. I noticed that two weeks ago when I attempted a novel interpretation of selfhood (Why do we have a sense of self? ), and at other times when I have expressed a new idea to Buddhists, the reply is almost always to recite Buddhist dogma at me. Not only is it boring, but it so clearly does not come from personal experience that it almost makes a mockery of the Buddha's teaching methods. We know that some Buddhist metaphysical arguments have raged for more than 1000 years with no conclusion in sight, and this should alert us to the intractability of metaphysics and dogmas. This innermost thing, this self (ātman)--is dearer (preyo) than a son, it is dearer than wealth, it is dearer than anything else. If a man claims that something other than his self is dear to him, and someone where to tell him that he will lose that he holds dear, that is liable to happen. So a man should only regard only his self as dear to him. When a man regards only his self as dear to him, what he holds dear will never perish.